Middle Creek Roofing is an Amish, BBB accredited and award winning contractor that excels in roof repair. If you've been dealing with leaks throughout your roof or have noticed damaged or blown shingles around your home, then you need a roofer you can trust. That's why Middle Creek Roofing has been providing unmatched roof repair services to homeowners throughout the Greater Montgomery County, Chester County & Nearby area. Fixing minor roofing issues quickly can also help extend the life of your roof so you can avoid having an unexpected roof replacement. We believe in doing whatever it takes to solve your roofing needs using top-quality products and highly trained technicians that are guaranteed to deliver. Get an estimate today on a roof repair by clicking the estimate button. Give your roof the attention it deserves. 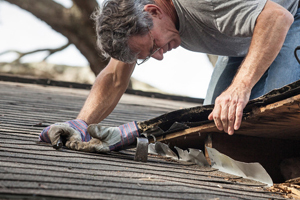 Fixing common roofing problems like wood rot and damaged shingles can help extend the life of your roof. The soffit (wood or metal panel on the underside of the roof's overhang) and the fascia (vertical board that runs along the roof line) are both at risk for water damage over time. Animals, like birds, squirrels, and raccoons like to nest in the soffit, and soft spots in the wood caused by rot will make it easier for them to gain access. You want to be able to rely on a roofing contractor you can trust, which is why Middle Creek Roofing is here to help you. We fix a wide range of roofing issues, from leak repairs, to emergency roof repairs, damaged shingles, or even signs of wood rot and aging. If you live in Lancaster, Newmanstown, the Main Line, Chester Springs, Wayne, York, Haverford, or any area nearby, contact us today to get started on your roof repairs, and if necessary, roof replacement.